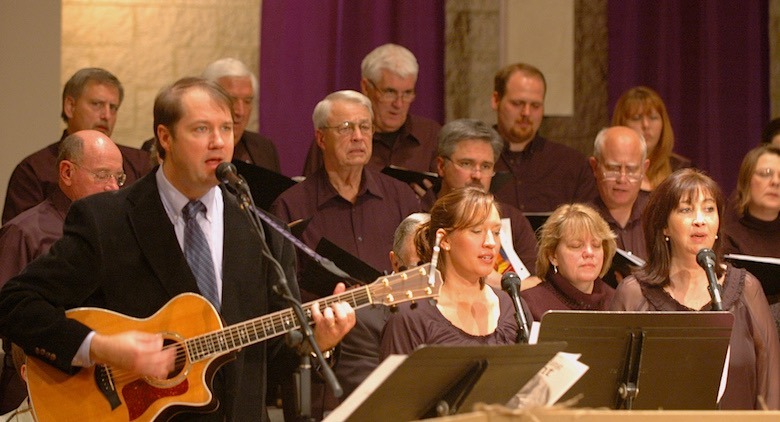 Worship guitar, where you strum along to songs of worship, either on your own or with a group is easy to learn. Here's how. Worship guitar: if you often watch and listen in admiration as someone at your church or worship group plays along on their guitar as you sing, then you've probably thought about how great it would be to be able to play yourself. The good news (the other good news, that is) is that it's not difficult to learn. Lot's of people are put off, however, at the very early stages because they find that making chord shapes with their left hand, or getting the strumming patterns with their right hand is just too difficult. The lessons are on video, so it's very easy to watch, listen and play along with Aaron, and of course you can pause and rewind whenever you need. Aaron says that his course* is perfect for complete beginners and also for anyone who's been playing guitar for less than a year. As well as teaching you chords and songs, Aaron has also included warm-up exercises and exercises to help you improve your 'muscle memory' – essential for getting to the point where your fingers move smoothly from one chord to the next. Perhaps best of all, Aaron says that everyone who purchases his course has free, unlimited and direct access to him and his support team if you get stuck. And there's a 60-day money back guarantee, so if you decide it's not for you, you can cancel with no questions asked. Please click here to find out more about Aaron's course. *A note about the links on this page. If you decide to go ahead and try out Aaron's worship guitar course after clicking a link on this page, Guitar Hive will receive a modest commission. It's a way for us to earn income to keep the site going, while keeping adverts to a minimum.